This lesson is a great way to combine Physical Activity, Science, and Math all in one. I adapted this lesson from 'Oh Deer' which can be found in the Project Wild Teacher's Handbook. In our science unit this past year we covered gr. 3/4 habitats and communities but only looked at species in our school yard. Purpose: To integrate science, math and physical activity. 1. Before you play the game, have 2 students volunteer to be 'documentation specialist'. Their job: to record the squirrel population during the game. - First stage: play just with squirrels and basic needs. 1. With the whole class post the results (the charts) that both 'documentation specialists' collected on an Elmo. 3. 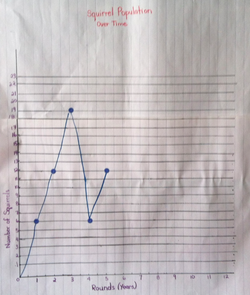 Group students in small groups (2-3) and have them practice their own graphing with stage 2 results. Formative: Can they make connections with/between data collected and relate it back to big ideas in science?